After having practiced almost daily for several years and having studied with different teachers from all Yoga traditions Moritz decided to start teaching Yoga. This was over 10 years ago; even while studying at a Berlin Music Colleague he was enthusiastic in sharing his knowledge. Visiting the Jivamukti Yoga Center in Munich he realized where he belongs. The love, the strength and the unlimited knowledge of Sharon Gannon (founder of the Jivamukti Yoga Method) inspired him to dive deep into the path of Yoga. He completed therefore the Jivamukti Yoga Teacher Training in NYC with his teachers Sharon Gannon and David Life and the 500h Apprenticeship Program with Dr. Patrick Broome in Berlin. Followed be the Advanced Certification Board in NYC. 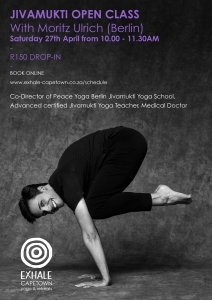 He is teaching workshops all over Germany and Europe, is part of the international Jivamukti Yoga Teacher Trainings as a co-facilitator, mentor and anatomy teacher, and is the program director of the continuing education programs at his Jivamukti Yoga School in Berlin.